Before 2009 Toyo University had only finished in the top three once in the history of Japan's biggest sporting event, the Jan. 2-3 Hakone Ekiden university men's road relay championships, all the way back in 1960. In Hakone's 85th anniversary running in 2009, the tens of millions of fans who watch Hakone live on TV and along its ten-stage, 217.9 km course were witness to the birth of a legend as Toyo first-year Ryuji Kashiwabara singlehandly lifted the team to the winner's podium for the first time with a stunning course record on Hakone's most celebrated stage, the 23.4 km Fifth Stage with nearly 900 m of climb. With Kashiwabara Toyo was almost untouchable at Hakone; he won the Fifth Stage all four years at Toyo and set stage records on it in three of them. Every time he broke the record, Toyo took the overall win, transforming themselves from the likable underdogs to the best of the best. Kashiwabara's senior year in 2012 Toyo redefined Japanese collegiate distance running by taking more than 8 minutes off the Hakone course record, breaking both the Day One and Day Two course records and becoming the first team to average under 3 min/km for the entire 217.9 km course. Team members said they wanted to give Kashiwabara the win without relying on him after he had given them everything for the three years before, and it's fair to say they succeeded in that goal. But since Kashiwabara's graduation Toyo have been unable to overcome his legacy and prove that they are truly the best and not just a second-class team lucky to have had a once-in-a-generation talent in their ranks. In every major university ekiden since Kashiwabara left, the 2012 Izumo Ekiden, 2012 National University Ekiden, 2013 Hakone Ekiden, 2013 Izumo Ekiden and 2013 National University Ekiden, Toyo came 2nd. The teams that beat them were different every time, but as the competition came and went and Toyo's athletes continued to grow they could not find that something that would at last put them on top without the hand of Kashiwabara. Finally, in what may be Toyo's last chance for a few years, all that changed today. On Day One of this year's 90th Hakone Ekiden Toyo scored the win on the strength of stage wins from its star seniors, identical twins Keita and Yuta Shitara, in the second-fastest time ever behind only Toyo's own 2012 winning run. 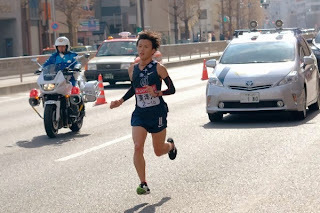 In 2012 Toyo ran 5:24:45 with a 1:16:39 Fifth Stage record by Kashiwabara. This year Toyo covered the 108.0 km Day One in 5:27:13, with captain Keita Shitara running the Fifth Stage in 1:19:16 to become its fourth-fastest man ever. Fifth Stage aside, Toyo's first four men ran 9 seconds faster than they did in the 2012 course record, meaning that although Kashiwabara represented roughly a 2 1/2 minute advantage, as a team they were better than ever. Riding the momentum of that knowledge, Toyo took complete control of Day Two. With just a 59-second lead over 2013 Izumo Ekiden and National University Ekiden champion Komazawa University, every one of Toyo's five men on the 109.9 km Day Two ran to the limit of his ability. Downhill Sixth Stage senior Keisuke Kusaka ran the tenth-fastest time ever on the 800 m-descent course to open the lead to 1:17, just under Toyo head coach Toshiyuki Sakai's requested 1:20. Star first-year Hazuma Hattori, the younger brother of Toyo's Second Stage man Yuma Hattori, won the Seventh Stage in its seventh-fastest time ever, widening the lead beyond Sakai's 1:40 projection to 1:54, a critical blow to Komazawa's chances for its ace senior Shinobu Kubota to run them down on the Ninth Stage, Day Two's longest stage at 23.2 km. On the Eighth Stage Toyo junior Ryu Takaku dealt Komazawa's hopes their coup de grâce, running the stage's all-time fourth-fastest mark to take Toyo's lead to more than a kilometer, 3:40 ahead of Komazawa at the Ninth Stage handoff. Komazawa's Kubota did his best, the only man on his team to make up ground on Toyo on Day Two as he ran the Ninth Stage's all-time fourth-best time, but could only pick up 28 seconds on Toyo second year Kazuki Uemura. Toyo anchor Kento Otsu inherited a 3:12 lead from Uemura, still over a kilometer ahead of Komazawa anchor Kenya Sonota, and could have played it conservatively, all but guaranteed of the win. Instead, he set off at 100% for the 23.1 km anchor stage, more than a minute ahead of course record pace at 5 km. Coach Sakai gently told him to relax and take it easy, but senior Otsu continued to go for the gold in his final university ekiden. On track with 5 km to go, he began to tighten up and slowed just enough to miss the record, 9 seconds off the mark but getting the anchor stage's all-time third-best time. For fearlessly going after the record when he could have played it safe, Otsu won the 2014 Hakone Ekiden MVP award. More importantly, he got the win. Crossing the line 4:36 ahead of Komazawa, an ecstatic Otsu brought Toyo home to its first university ekiden title since the Kashiwabara era, finally lifting the weight of the thought hanging over Toyo, the thought that it might have only been as good as was in those years because of one man. Toyo's Day Two time of 5:25:38 broke its 2012 Day Two record by 1:13, its overall time of 10:52:51 for the full two-day race the second-fastest in Hakone history and only 1:45 behind 2012's record. Less than half a second a kilometer. It cut the distance to Kashiwabara almost in half and broke the 3:00 min/km barrier without him for the first time, its ten men averaging a 1:03:13 half marathon each and raising the possibility that, working together, they might some day rise to an even greater height than he took them. Throughout the race coach Sakai called positive encouragement to his runners, telling them that they looked good, that they were going a good job, encouraging them to do more or asking them to hold back. In post-race interviews Coach Sakai said that his message to the team this year had been for each of them to shave off just one second, whatever that meant to each of them. Seventh Stage winner Hazumi Hattori said that the positive atmosphere and emphasis on enjoying running at Toyo was a big part of their strength as a team, that it was fun to be a member and that that was the secret of their success. With stage winners Otsu and the Shitaras graduating along with excellent downhill man Kusaku Toyo won't completely surpass its Kashiwabara course record anytime soon, but its first win without him, its incredible quality, and the positive, encouraging atmosphere the team exudes under the young Sakai means Toyo will remain one of the best for the foreseeable future. Compare this to the atmosphere at Komazawa, which this season became the Izumo Ekiden course record holder and scored an eleventh national title. Throughout the race head coach Hiroaki Oyagi shouted and screamed things at his runners from a loudspeaker in his chase car that would get a coach in the NCAA fired. After Day One, when Komazawa ran 5:28:12 to become the second-fastest team ever on the Day One course, he blamed star junior Kenta Murayama, who finished 2nd on the ace Second Stage, for Komazawa not winning the day. On Day Two Komazawa ran one of the fastest performances in Hakone History to finish in 10:57.25 overall, faster than any school in Hakone history except Toyo, but hanging their heads in disappointed shame. Defending champion Nittai University took 3rd in 11:03:51 to become the fifth-fastest school ever at Hakone and 2011 champion Waseda University likewise ran faster than all but four schools ever have, but there were no smiles to be found on either team. Not until 5th-placer Aoyama Gakuin University, another school with a younger coach, Susumu Hara, with different ideas and an emphasis on enjoyment, tied its all-time best placing did another school look happy, anchor Ikki Takeuchi and his waiting teammates whooping and laughing as he came down the final straight. As the level of Japanese collegiate running continues to climb rapidly, all 23 schools fielding runners with 10000 m bests under 29 minutes and most with at least one sub-63 half marathoner, many of the younger coaches with a kinder touch like Sakai and Hara seem to be the ones leading the way. Meiji University, with eleven men holding 5000 m bests under 14 minutes, returned from a bad Fifth Stage to rise as high as 4th during Day Two but dropped to 6th over the last two stages. Further back, the race for the seeded top ten was one of the best in memory. Each year the top ten finishers are guaranteed a place at the following year's Hakone Ekiden, freeing them up to run October's Izumo Ekiden. 11th-place and lower teams must requalify against other schools hoping for Hakone glory at October's Yosenkai 20 km qualifier instead of Izumo. This race to get into the seeded top ten bracket usually provides at least as much Day Two drama as what is happening up front. This year six teams were in range of the last four seeded places in 7th-10th behind Meiji, at one point all within 18 seconds of each other. The tense and turbulent battle between the six had nearly constant turnover over the course of the day. Nihon University, 10th at the end of Day One, dropped out of the top ten briefly before coming back to 7th. Last year's 4th-placer Teikyo University was running 12th, but after a great run by Ninth Stage man Taketo Kumazaki it moved up enough to repeat in the seeded bracket in 8th. At one point Takushoku University first-year Tomofumi Uda, holding Takushoku steady in 8th, collided with a neighboring runner and fell hard, having trouble getting up and slowing badly enough to drop to 10th place, giving Takushoku a scare as he came just seconds ahead of 11th and the dead zone outside the seeded bracket before later runners got the team back up to 9th. Daito Bunka University and Hosei University, missing its star runner Kazuto Nishiike who was injured Dec. 29 when he fell down a flight of stairs, staged a back-and-forth battle for 10th, Hosei anchor Hirotaka Takanashi bearing down on DBU's Ryo Onishi in the home straight but unable to close. Tokai University seemed a lock for a seeded finish after running most of the race well inside the cutoff but had a disastrous anchor run to drop to 13th. Yamanashi Gakuin University, out of competition after Second Stage Kenyan Enoch Omwamba suffered a stress fracture and was forced to stop but its remaining members allowed to run without their times counting in the overall scoring, ran the 9th-fastest time on the Day Two course, meaning it was in the action for most of the day even without actually being in it. Along with the world-class times by Toyo and Komazawa up front, the dense and tense racing mid-pack showed the best of what makes the Hakone Ekiden the greatest of road races. Excellent comparison of the coaching styles between Sakai (and Hara) and Oyagi. Oyagi-san's military style of coaching worked well back in the day when kids were much more thick-skinned and used to constant nagging from their parents and teachers, but not anymore. Clearly, Toyo was much more of a 'team' than Komazawa. Komazawa's runners' strength in the early 2000s was their ability to dig deep and find something extra in the last 5km when Oyagi would yell over the loudspeakers. In my opinion this is the key to winning at Hakone. I would love to see stats of the time differences between all the runners for their last 5km. My guess is that there is a huge gap between Toyo and the rest. As a Komazawa supporter, it's painful to watch the disconnect between the coach and his kids. As you mentioned, Aoyama Gakuin is a team to watch out for and I expect them to contend for a title soon. I'd add Hosei's new head coach Tomo Tsubota, 36 and all-time Japanese #10 over the half marathon, to that list. Bad luck with Nishiike getting hurt this year but I'm expecting Hosei to increase in quality a lot over the next year or two. I don't think I would totally dismiss Oyagi, though. He is still the most successful college coach Japan has, with the Izumo CR, 11 National University Ekiden titles including the last three years, and a time at Hakone this year that would have beaten every team ever except for Toyo in '12 and '14. But, winning Hakone does take something extra that Komazawa seems to have lost under him this generation, so you may be right to some degree. I haven't totally written off Oyagi yet, but as a Komazawa supporter who was spoiled with the glory days 10 years ago, I guess I am getting a bit impatient with the 2nds and 3rds despite his superstar caliber runnes. I think he started having problems when he started to recruit the big names such as the Ugachi/Takabayashi/Fukatsu/Hoshi group. I still don't think he has gotten completely used to learning how to deal with superstars and as a result, his attention to the lower level kids has waned. All speculation of course, but that's what it looks like to me. Also, in regards to up and comers, you can probably add Komadai alumni Maeda (Kokugakuin and Kamiya (Musashino Gakuin)to the list.